Fornara et al. (86) reported a prospective, controlled, nonrandomized animal and patient study to determine the systemic response to laparoscopic and open surgical procedures. In the animal study, 26 female pigs aged six months underwent either a laparoscopic bilateral varix ligation followed by bilateral nephrectomy (group I), introduction of trocars (group II), or establishment of an open surgical approach (group III). In the patient study, 145 patients underwent various laparoscopic procedures (unilateral nephrectomy =17, bilateral laparoscopic nephrectomy = 7, renal cyst marsupialization = 29, varix ligation = 17), open surgical procedures (nephrectomy = 42, inguinal orchidectomy = 8), or extracorporeal shockwave lithotripsy = 25). A weakness of this study is the fact that the patient groups are not evenly matched. IL-6, IL-10, and C-reactive protein were measured before, during, and after the operative procedure. 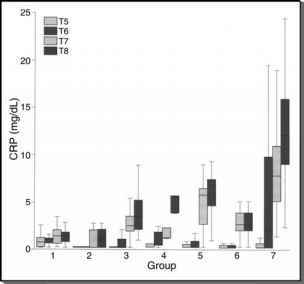 In animals and patients, laparoscopy resulted in significantly lower serum levels of C-reactive protein during and in the postoperative period. Animals in group I showed a five-fold elevation, in group II a three-fold elevation, and in group III a nine-fold elevation of C-reactive protein. In patients, C-reactive protein was twice as high after open unilateral nephrectomy than after laparoscopic unilateral or bilateral nephrec-tomy. Elevation of IL-6 was less pronounced during laparoscopy, extracorporeal shockwave lithotripsy, and minor procedures like laparoscopic varix ligation or inguinal orchidectomy when compared to an open unilateral nephrectomy. 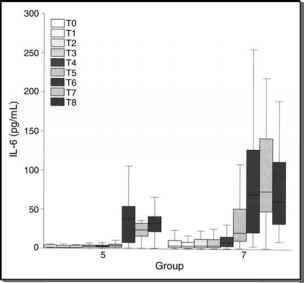 IL-10 was not significantly different among the patient groups (Figs. 4 and 5). The authors concluded that the acute-phase response to operative trauma correlated more to the approach than to the extent of the procedure. Larger operations like nephrectomy trigger a marked systemic acute-phase reaction, which can be reduced by laparoscopic access. In minor operative procedures like varix ligation or exploration of cryp-torchidism, laparoscopy offers technical advantages rather than minimal invasiveness as the immune response in these situations is much less. FIGURE4 ■ IL-6 levels in laparoscopic (group V) or open nephrectomy (group VII). TO = 24 hours preoperative, T1 = beginning of anesthesia, T2 = trocar insertion/skin incision, T3 = pneumoperi-toneum/peritoneal incision, T4 = ligation of renal artery, T5 = end of procedure, T6 = six hours postoperative, T7 = 12 hours postoperative, T8 = 24 hours postoperative. Abbreviation: IL, inter leukin. Source: From Ref. 86. 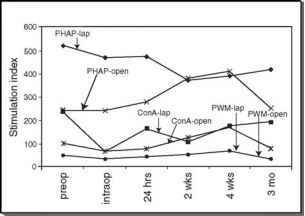 FIGURE5 ■ CRP serum levels of group I = ESWL, group II = lap varix ligation, group III = lap renal cyst marsupialization, group IV = open inguinal orchidectomy, group V = lap unilateral nephrectomy, group VI = lap bilateral nephrectomy, group VII = open unilateral nephrectomy from T5-8 (T5 = trocar removal/wound closure, T6 = six hours postoperative, T7 = 12 hours postoperative, T8 = 24 hours postoperative). Abbreviation: CRP, C reactive protein. Source: From Ref. 86. 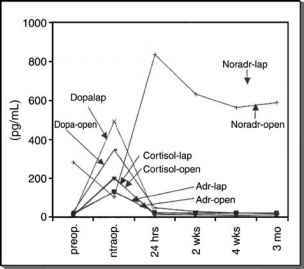 FIGURE6 ■ Stress response after laparoscopic (lap) and open nephrectomy for localized renal cell carcinoma. Source: From Ref. 87. FIGURE 7 ■ Inflammatory response after laparoscopic (lap) and open nephrectomy for localized renal cell carcinoma. Source: From Ref. 87. FIGURE8 ■ Lymphocytic response after laparoscopic (lap) and open nephrectomy for localized renal cell carcinoma. Source: From Ref. 87. 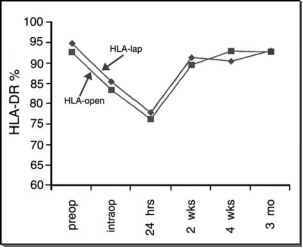 FIGURE9 ■ HLA-DR response after laparoscopic (lap) and open nephrectomy for localized renal cell carcinoma. Source: From Ref. 87.
hypothesis. Preoperative immune dysfunction in renal cell carcinoma is known to be complex (88,89) and the findings of this study thus come as a surprise and do not explain the quicker short- and long-term recovery in patients undergoing laparo-scopic total nephrectomy. It is feasible that for less extensive procedures, such as laparoscopic cholecystectomy, the laparoscopic approach is immunologically superior. In contrast, ablative laparoscopic renal surgery is quite extensive and may not have a definite immunological benefit, as assessed by current techniques to measure the immune response. 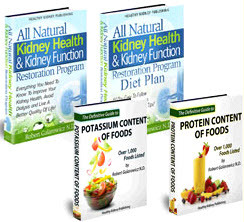 Another possible explanation for the discrepancy may be the biology of renal cell carcinoma. It is feasible that the malignant disease process results in a significant alteration in immune function, such that differences between laparoscopic total nephrectomy and open nephrectomy are not detectable. 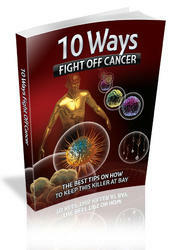 Similar findings have been reported in randomized trails of surgery in colonic malignancy. Tang et al. (73) observed no difference in the immune response in laparoscopic-assisted versus open sigmoidectomy for colorectal cancer and Leung et al. 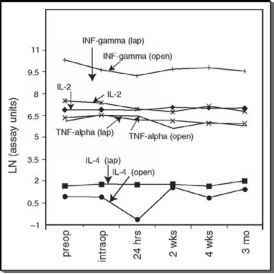 (27) noted differences in the stress response but no differences in the immune response. 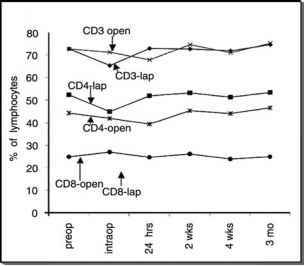 FIGURE 10 ■ Cytokine response after laparoscopic (lap) and open nephrectomy for localized renal cell carcinoma. Source: From Ref. 87. 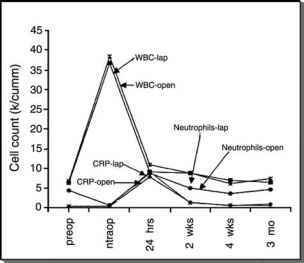 FIGURE 11 ■ Mitogen proliferative response after laparoscopic (lap) and open nephrectomy for localized renal cell carcinoma. Source: From Ref. 87.